“And the questions naturally arise – What is the new principality of Kashghar? Kashmir and Kashghar. 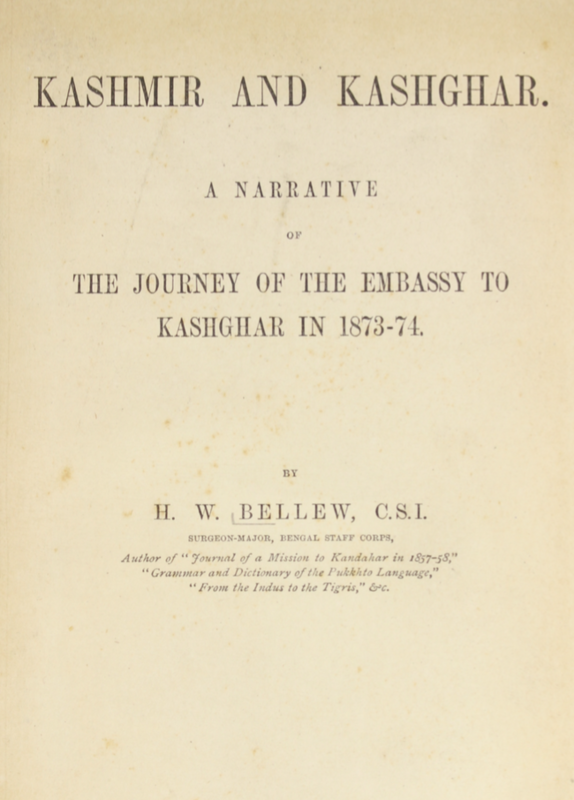 A Narrative of the Journey of the Embassy to Kashghar in 1873-74, written by H. W. Bellew, CSI, Surgeon-Major of the Bengal Staff corps, and published in 1875, is a detailed account of the diplomatic expedition organized by the British Embassy in India to Kashgar for the purpose of visiting the new leader of Kashgaria, Yaqub Beg (in this book spelled as Yacub Beg). After the revolution in 1862-1863, Eastern Turkestan was separated from the Chinese Empire and a new Muslim State was born. The British expedition under the leadership of Sir Douglas Forsyth was sent to Kashgar to conclude a treaty of commerce with the Khanate of Kashgar and to ensure diplomatic ties. Throughout the journey from Rawalpindi in British India to Kashgar, details about the road and the different stops are given, along with reflections about the history and political changes in the region. The book offers a valuable insight into British political interests in Central Asia during the reign of Yaqub Beg in Eastern Turkestan. At a time when the Chinese Empire was weak and the Russians were expanding their dominion in Asia, the Muslim movement grew stronger in Eastern Turkestan and eventually instigated the Tungani rebellion in 1862. The Chinese rule in Eastern Turkestan was overthrown and several self-proclaimed leaders from influential families fought for power. Finally, Yaqub Beg, a commandant who had quickly risen in rank, became the leader (Amir) of Kashgar and subsequently the whole of Kashgaria. The delegation from British Embassy in India was sent to meet with the new leader in Kashgar in order to sign a treaty of commerce between Britain and the new Muslim State. The delegation enjoyed free movement and travel throughout the country as the honored guests of the Amir, Yaqub Beg. The expedition member and author Henry Bellew documented the journey leading up to the meeting with Yaqub Beg, also known as Atalik Ghazi, whom Bellew described as a remarkable and capricious man trusting no one. As Islamic rule had recently been declared in Kashgaria, the life of the people living in the region drastically changed as they were now to be judged and ruled by the Islamic Sharia law, which was to a great extent dependent on the mood of the new leader Yacub Beg. Traveling on foot and horseback from Rawalpindi, the expedition passes through Kashmir, Srinagar, Tibet, Lammayuru in the Ladakh province, Yarkand and Sanju among other places. The first chapter provides a general overview of Eastern Turkestan’s main geographical features, climate, people, and production, followed by thorough historical accounts of migrations, wars, the advent of Islam to the region in the 11th century, and numerous Muslim invasions interrupting Chinese rule up until the recent advancements of Yaqub Beg. In Kashgar, Bellew is interested in people’s living conditions. Although local inhabitants are kept away from the expedition, Bellew with his knowledge of Farsi is able to converse with some Afghans. He finds out that after the revolution, Afghans and other minority populations have been dispersed around the country. Due to the great loss of men during battles, strangers have been allowed to marry women from Kashgar, after which they are not, however, allowed to ever go back to their home country.